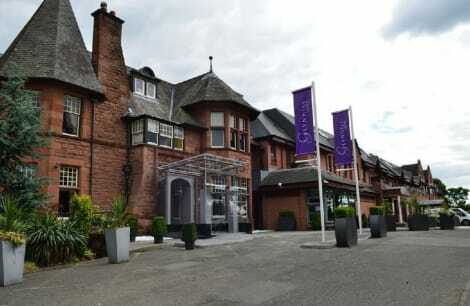 The Glynhill Hotel is ideally situated, just 15 minutes from Glasgow's Vibrant City Centre and only one mile from Glasgow Airport (not in flight path). The hotel offers 145 well appointed rooms, state of the art conference and banqueting facilities and a range of restaurants and bars plus a luxurious leisure club. It is also situated only 5 minutes from Braehead Shopping Centre, Ikea and Xscape Leisure Park. ** FREE AIRPORT TRANSFERS ** The Normandy hotel is located close to Glasgow and Glasgow International Airport. It features a modern fitness centre and a great restaurant. Hotel is ideal for both the business and leisure traveler and offers free private parking and free Wi-Fi. Comfortable rooms provide relaxing accommodation for your trip to Glasgow, excellent restaurant/bar facilities and friendly staff are always at hand. Hotel's restaurant has been voted UK's best Restaurant of the year at an airport location, please come and join us for a lovely food. Renfrew is the former county town of the historic county of Renfrewshire, six miles west of Glasgow in the west-central lowlands of Scotland. Renfrew is known as the ‘Cradle of the Royal Stewarts' due to its early link with the Royal house of Scotland and Great Britain. With a wonderful mix of nearby countryside, water and nature, combined with the nearby excitement of Glasgow, Renfrew has much to offer the demanding tourist. The town has a long and distinguished pedigree dating back to the 12th century, still evident in the remains of its Royal Stewart castle, the parish church with its 15th-century effigies and the impressive 19th-century town hall with its 100 foot tower. A ferry has operated between Renfrew and Yoker across the River Clyde for more than 300 years. The last car ferry sailed across in 1984 and has since become a popular floating music venue at Anderston Quay in Glasgow – well worth a visit. Children will love a trip on the passenger-only ferry which still plies the route. If you visit Xscape, Scotland's Ultimate Entertainment Destination, you'll discover a mountain of family entertainment, with over 30 businesses under one roof, including the UK's longest indoor ski slope at 200 metres. Here you can also snowboard, sledge and ice slide, then eat at one of the cafés and bars. How about a film, bowling or dodgems? Perhaps have a go at one of the two adventure golf courses, the climbing wall or thrilling fan drop? There's not enough time in a day to enjoy all the activities on offer, and there's still more to mention – Laser Station, aerial assault park and Robocoaster robotic arm ride, huge soft play area and masses and masses of shopping, cafés, bars and restaurants. Renfrew Golf Club is recognised as one of the finest inland golf courses in Scotland, and visitors are welcome to play the scenic, tree-lined parkland course. Normandy Golf Centre in Renfrew includes a 20-bay floodlit range, golf shop and short game area. Glasgow is the largest city in Scotland and is only five miles from Renfrew. You could explore the city's museums and galleries, finding everything from dinosaurs to Dali, or tour the magnificent Glasgow Cathedral. Football fans can take a look behind the scenes of Scotland's national stadium at the Hampden Experience, and there's the Loch Lomond Aquarium and Glasgow Science Centre nearby. There are a number of lovely places to eat in Renfrew and, of course, in Glasgow you have choices galore. Ristorante Piccolo Mondo in Renfrew offers traditional and contemporary Mediterranean specialities, authentic Tuscan recipes and a large selection of wines, presented in a warm and relaxing ambience. Renfrew pubs are varied, from The Ferry Inn on the banks of the Clyde to the many town centre pubs such as the historic Wheatsheaf and the popular Burns Howff. 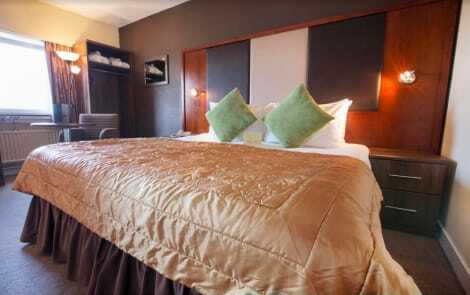 There are a variety of Renfrew hotels from which to choose, whatever your budget and tastes.